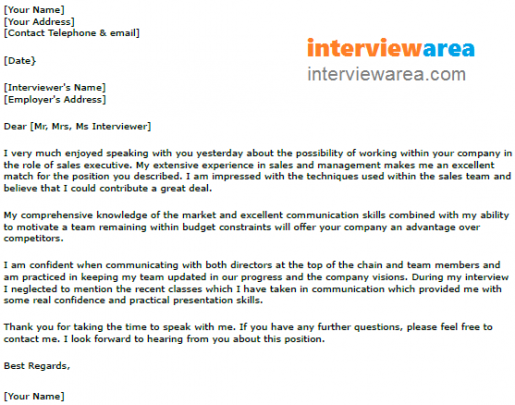 Use this email example to say thank you to the employer for them taking time to interview you. I very much enjoyed speaking with you yesterday about the possibility of working within your company in the role of sales executive. My extensive experience in sales and management makes me an excellent match for the position you described. I am impressed with the techniques used within the sales team and believe that I could contribute a great deal. My comprehensive knowledge of the market and excellent communication skills combined with my ability to motivate a team remaining within budget constraints will offer your company an advantage over competitors. I am confident when communicating with both directors at the top of the chain and team members and am practiced in keeping my team updated in our progress and the company visions. During my interview I neglected to mention the recent classes which I have taken in communication which provided me with some real confidence and practical presentation skills. Thank you for taking the time to speak with me. If you have any further questions, please feel free to contact me. I look forward to hearing from you about this position.